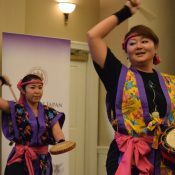 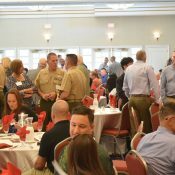 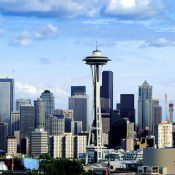 The Japan-US Military Program’s recent event with the Nisei Veterans Committee in Seattle was highlighted in an article in the North American Post by Shihou Sasaki. 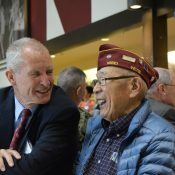 Members of the U.S. Army, the U.S. Air Force, the Japan Ground Self-Defense Forces, along with members of the broader Seattle community came together at the event to honor the Nisei Veterans who served in the segregated 100th Battalion/442nd Regimental Combat Team (RCT) and the Military Intelligence Service (MIS), during World War II. 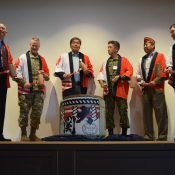 Members of the U.S. Army, the U.S. Air Force, the Japan Ground Self-Defense Forces, along with members of the broader Seattle community came together at this Japan-US Military Program (JUMP) event to honor the Nisei Veterans who served in the segregated 100th Battalion/442nd Regimental Combat Team (RCT) and the Military Intelligence Service (MIS), during World War II. 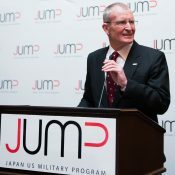 As part of JUMP’s ongoing initiative to reach out to those who have served in Japan, JUMP intern Jin Lee interviewed Brendan Vargas, who has been living in Japan for that past 12 years. 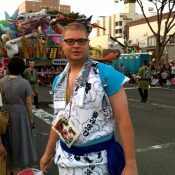 He is now ranked Master Sergeant, U.S. Air Force, AFN Misawa Station Manager at the Misawa Air Base.